A family reunion is not an official form. Instead, this is a form which is used when a person plans a big family reunion. The form allows him to add a detailed itinerary of events and a registration form in the end, and people who intend to attend the reunion are expected to fill up and mail him back. This gives him a clear idea of the amount of food to be ordered, bookings to be made etc. You may also Useful Event Registration Forms. This form comprises of the details of the various events and arrangements that mark the family reunion along with a form that the interested people need to fill up and mail back. People who don’t want anything elaborate, to estimate the number of people attending the reunion can use this form. It allows the interested parties to fill in their family details. 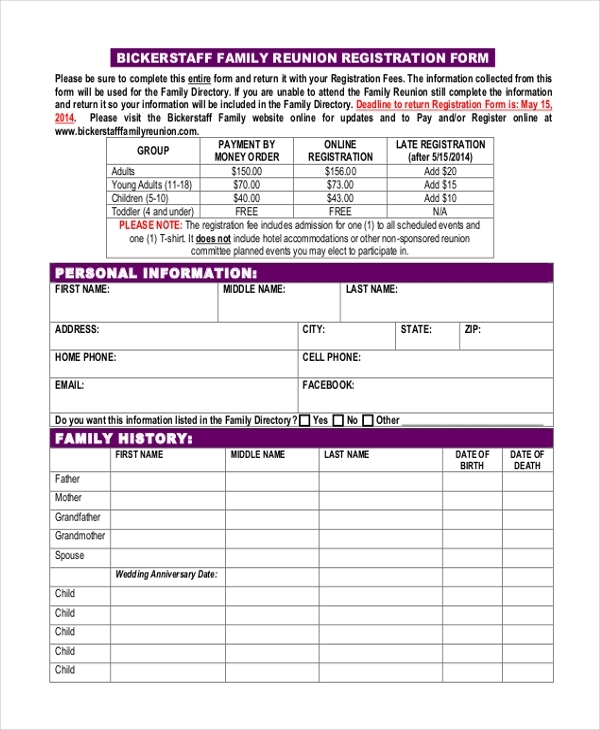 People who are interested in giving an interesting twist to their family reunion can use this form. They can make changes to the form and then share it with their family members. 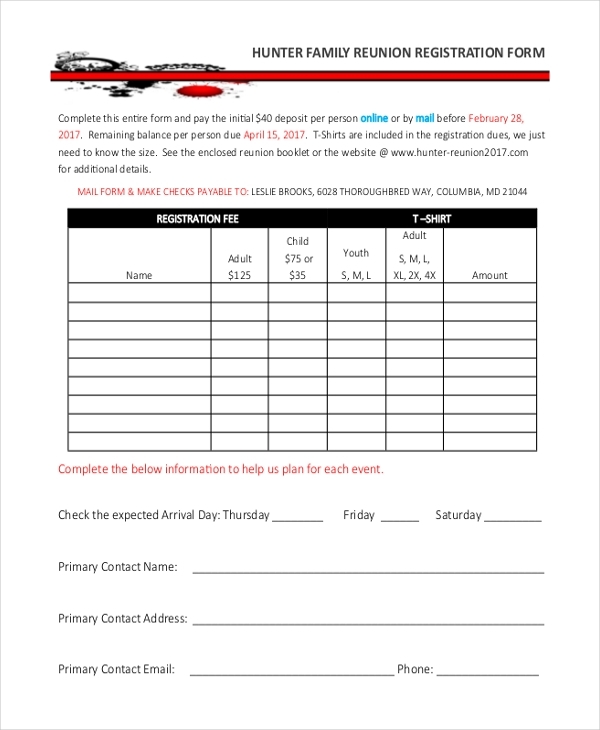 A family that plans reunions every year can use this form, not just for the upcoming reunion but to decide on a feasible way to collect funds for the reunion in the coming years. 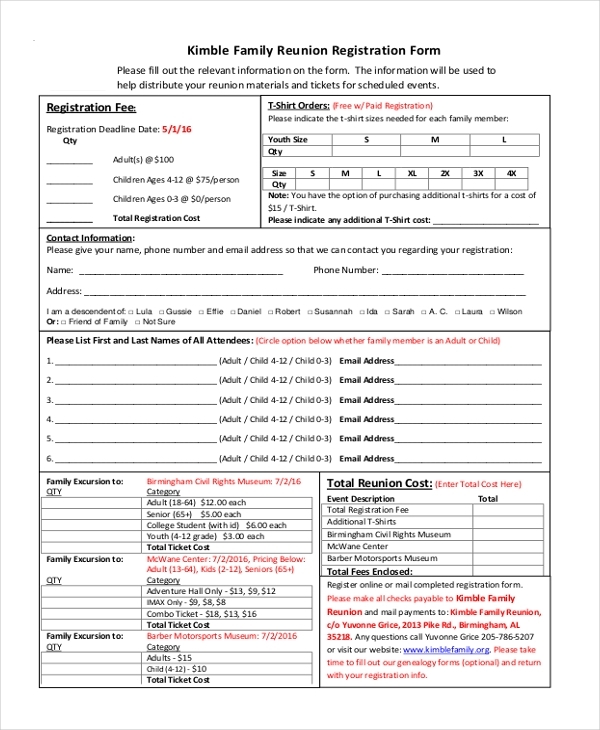 People who may be interested in making their family reunion, not just an itinerary but a whole world of information about the family can go ahead and use this form for their reunion. In case a family reunion is planned in a different venue, you can opt for this form which enables the organizer to find out the number of reservations that need to be made for the people who are attending the reunion. 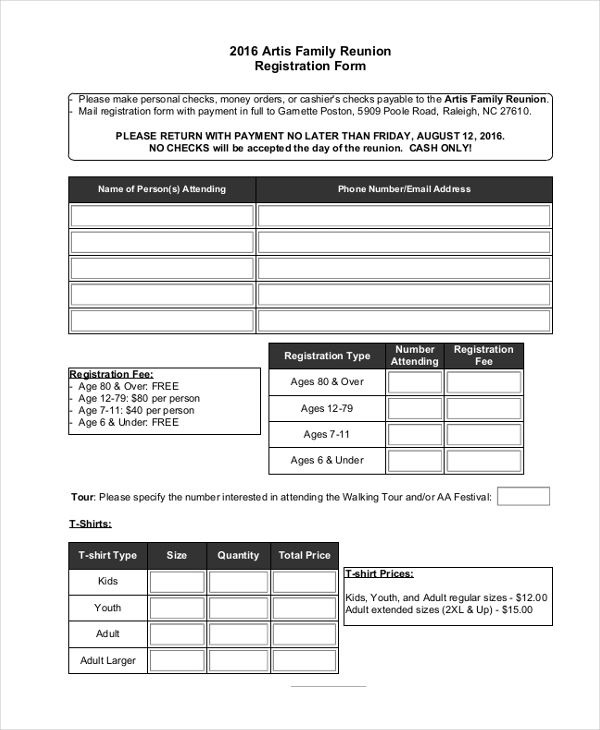 This family reunion registration form allows the interested parties to fill in the details about the number of people in their family along with their ages and sometimes even their T-shirt sizes. This form is mainly used to plan an annual family reunion. The interested people are required to add in their details and mail it to the organizer along with their contribution amount. Why Should One Use a Family Reunion Registration Form? Planning a family reunion is definitely not an easy task especially if the family is a huge one. Thus, these need to be planned well in advance making sure that there are enough food and bookings for all the people attending it. This can be quite confusing if you are not sure about the numbers who might be interested in attending the program. 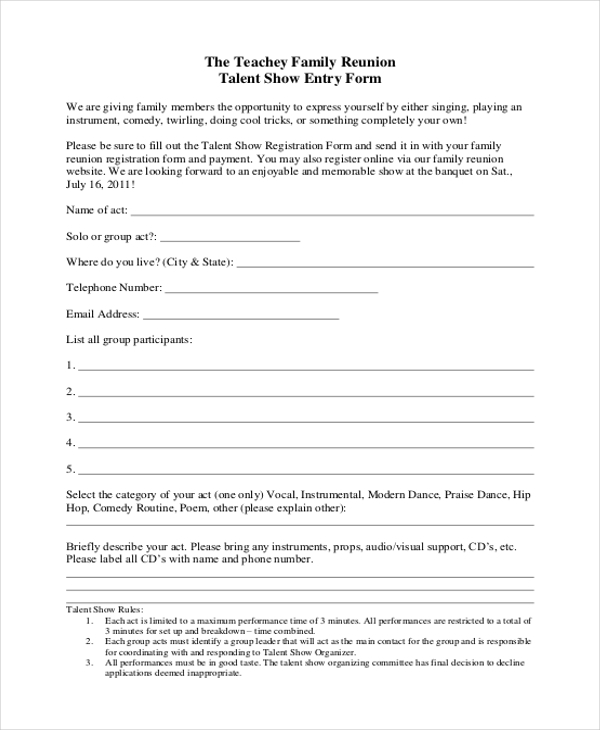 By using this family reunion form, you can be sure of the number of family members who will attend the function and thus make the plans accordingly. Useful Hotel Registration Forms. 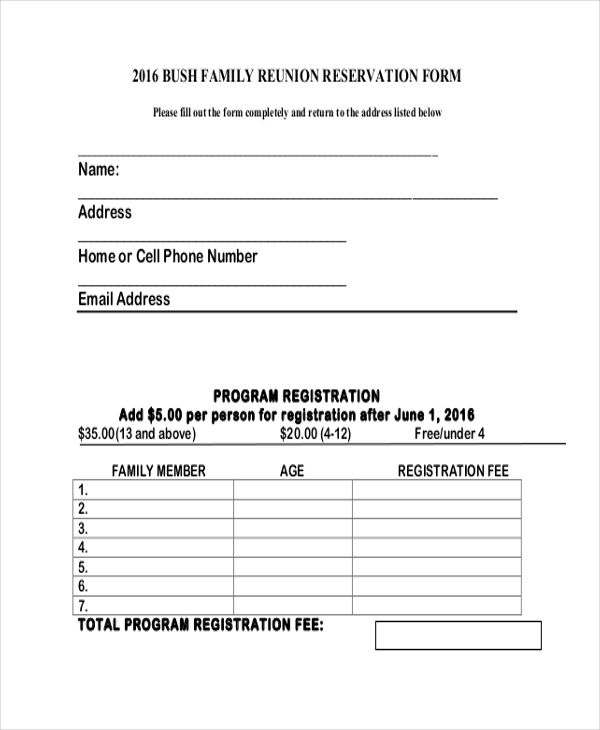 What are the Benefits of Using a Family Reunion Registration Form? Allows the organizer to inform all the family members about the itinerary of the event. Makes it easier for the person to estimate the number of people who would be attending the function. Gives the person a clear idea of the details of each extended family like the number of members, their ages etc. 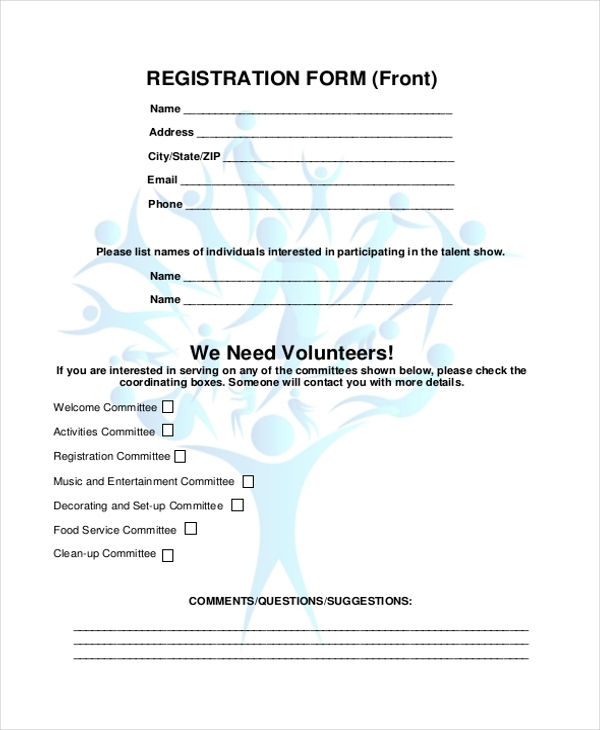 How can you Design a Family Reunion Registration Form? 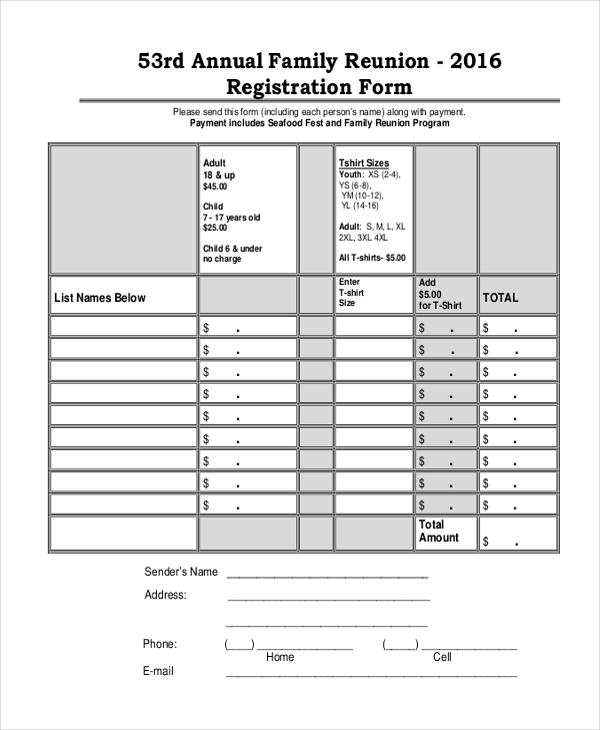 There are many different ways in which you can design a family reunion registration form. You can either go for a form that collects the details of the people or you can add an invitation and elaborate itinerary to it, along with the details of the contribution that each member needs to make. However, the form, in the end, should be an effective one where the interested parties can fill in the details of the people who would be attending the event from their end, the ages of each person, address, phone numbers and other contact details. Using a family reunion registration form will definitely simplify the task of planning the reunion. In fact, you do not have enough time to design one can look for it online. With a wide range of family reunion registration forms available online, finding one that suits your needs would be easy. All you need to do is download and customize it.